Recent national awards have positioned Grand Rapids as an environmental leader known for its commitment to sustainability, energy efficiency and climate protection. The city’s focused efforts to reduce energy consumption and greenhouse gas emissions began a few years ago and are already showing significant cost savings and numerous social and environmental benefits. 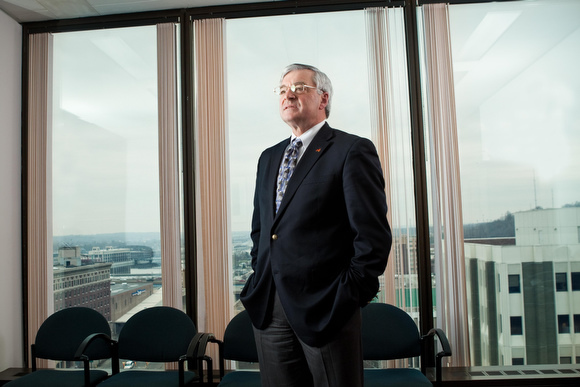 Earlier this summer, the U.S. Conference of Mayors (USCM) awarded Mayor George K. Heartwell first place in the large city category of the 2012 Mayors’ Climate Protection Awards. The award recognizes mayors for their innovative practices to increase energy efficiency and reduce greenhouse gas emissions. The first place award, sponsored by USCM and Walmart, granted $25,000 to the City of Grand Rapids to pass along to nonprofit organizations making a difference with sustainability and climate protection issues. The West Michigan Environmental Action Council (WMEAC) and Friends of Grand Rapids Parks each received $12,500 for their efforts in these areas. The Earth Day Network also recognized Grand Rapids as one of five model cities nationwide because of its sustainability efforts. An environmental advocacy group based in Washington, D.C., Earth Day Network partners with the Clinton Global Initiative’s Billion Acts of GreenÂ® Cities Campaign Commitment to provide select cities with strategies on how to reduce their carbon footprint. Along with these two awards, the City of Grand Rapids has earned recognition for having the most LEED-certified buildings per capita as well as many other “green city” achievements. In 2009, the City received more than $1.9 million in federal funding as part of the Energy Efficiency and Conservation Block Grant program. Part of this money was used to create a formal vision document for the City’s sustainable future. Known as the Energy Efficiency and Conservation Strategy (EECS), it was developed with input from the Mayor, City commissioners, City staff and community leaders. As a result, the Office of Energy and Sustainability was created to centralize the City’s focus on sustainability and energy efficiency, and Director Haris AlibaÅ¡ic has been tasked with finding economically feasible renewable energy options and working toward reducing greenhouse gas emissions and energy consumption ever since. With more than a few hundred buildings, the City’s current energy costs amount to roughly $8 million annually. AlibaÅ¡ic knows that if alternative and renewable sources are not utilized more, rising energy prices will substantially affect the City’s bottom line. “The more you can manage your consumption, the better position you are in to manage costs,” he says. Replacing all of the windows at City Hall and adding a sustainable roof resulted in a significant reduction in the City’s electricity consumption. In a few short years, they transitioned from using 110,000 megawatt hours to less than 100,000, creating substantial cost savings of more than 10 percent. Federal grants paid for these modifications as well as the solar panels that were installed on an existing LEED building. The City received permission to produce electricity on site at this facility. During the week, the building uses the energy it produces, but on the weekends, no one is there so the City is able to sell the unused energy back to Consumers Energy. Not only does this save on costs, but lowering the amount of energy used reduces CO2 emissions. Alternative energy sources such as solar may not result in cost savings immediately, but the City is focused on making long-term investments. Recently, and through grant funding, the City replaced the HVAC systems at two fire stations with geothermal energy, a technologically advanced system that captures the heat of the earth. Benefits may not be realized for years, but eventually, this technology will more than pay for itself. The City of Grand Rapids wants to encourage sustainability and reduced energy consumption practices from its residents as well. With the rise in hybrid and electric vehicles, the City recently installed $25,000 worth of charging stations throughout downtown parking ramps with the help of a federal grant. Another program initiated to serve the community is the BetterBuildings for Michigan program. This statewide program began in 2010 as the result of a $30 million grant awarded by the United States Department of Energy through the American Recovery and Reinvestment Act. The organization offers residents a comprehensive, home energy assessment for only $99. Performed by a certified energy contractor, the assessment uses sophisticated technology and equipment to help people find ways to improve their home’s energy performance, lower their utility bills and make their homes more comfortable. “We give customers the information and hope they act on it,” says Tucker. In addition, BetterBuildings installs energy-saving measures such as new programmable thermostats, low-flow showerheads, faucet aerators, pipe wrap and CFL light bulbs. They also offer incentives, rebates and affordable financing to residents to make it easier for them to implement the recommended changes. Administrators of the program expect to promote energy efficiency and cut utility costs for nearly 2,500 Grand Rapids homes by the end of December. Right now, theyâve worked with approximately 1,300 households. Tucker believes the less people spend on utilities, the more they will spend on local businesses. “The more circulating income in the community, the better off we all are,” he says. To promote a greater awareness of and support for sustainability community wide, the Grand Rapids Area Community Sustainability Partnership was created in 2005. What started out with only five founding members, including the Mayor, has now grown to include more than 200 businesses and organizations who are committed to the “triple bottom line” of sustainability by way of their environmental, economic and social actions. The Community Sustainability Partnership member organizations share ideas and best practices for sustainability in areas such as energy efficiency, renewable energy, recycling, waste management and more. Going forward, the City of Grand Rapids will continue to find ways to reduce energy consumption and costs, reduce greenhouse gas emissions and find alternative and renewable energy sources. With a goal to use 100 percent renewable energy by 2020, the City is committed to doing what it can to foster sustainability within its organization and the community as a whole. AlibaÅ¡ic and Tucker stress the need for everyone to make individual changes toward reduced energy consumption and sustainability. “We all need to use less energy,” says Tucker. The City of Grand Rapids’ current sustainability plan and progress report can be found on the Office of Energy and Sustainability website.